This review is a first for us. This is not only the first time we have reviewed two bourbons at the same time together, but it’s also the first time that we have broken the seal on two 1st batch bourbons at the same time as well. For those of you that are reading this, we have the feeling that you’re not a bourbon novice but we will try to break it down for both sides (and hopefully will not be too wordy in doing so). Campari, the company that owns Wild Turkey, decided to come out with a new “Whiskey Barons” line that pays homage to individuals that were essential to the history of bourbon and have resurrected old labels that were from pre-prohibition days in order to do so. Old Ripy and Bond & Lillard are the first releases of this series that does just this. So at the end of the day, we know that this is Wild Turkey juice relabeled in their honor. 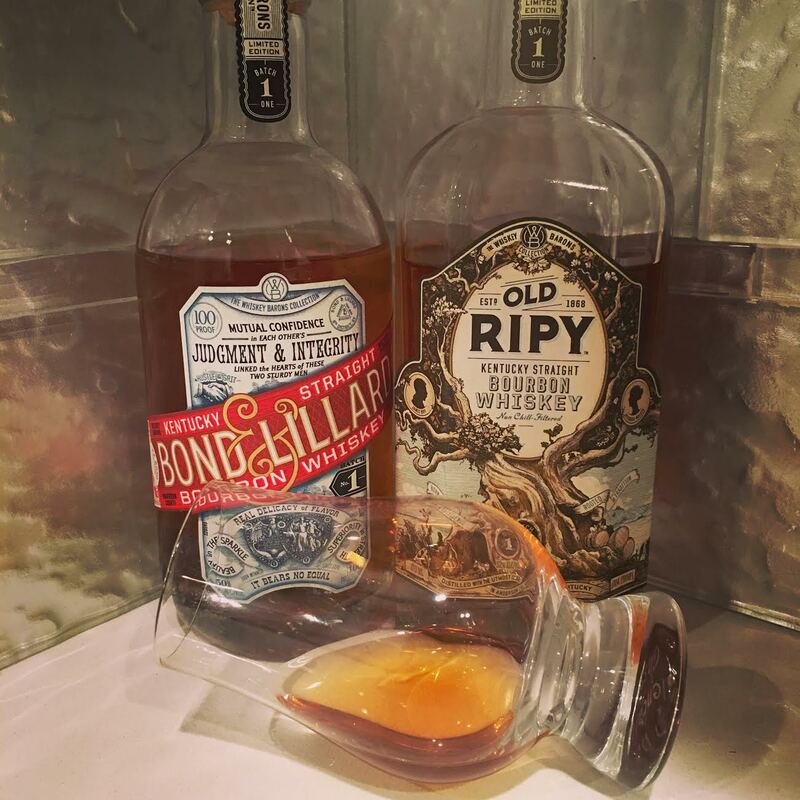 Old Ripy is bottled at 104 proof and Bond & Lillard at 100. We do not have distinct age statements, but we know Old Ripy is a mix of 8 and 12 year bourbons and Bond & Lillard is a minimum of 7 years. The downside to these releases is that they’re each $50 for a 375ml bottle, which is essentially $100 for a full bottle. We’ll save you all the folksy marketing language from both of these, and will get down to the business of why you’re here: should you bother looking for it? Before we begin, it’s interesting to note that both Jimmy and Eddie Russell were not involved in this release. Old Ripy is full of spice on the nose and on the first taste, but leaves you feeling quite disappointed with the thinness which follows. We could definitely notice spice and cinnamon on the first taste, but there was a heat that was not attributed to the alcohol. It was almost hotter on the front than George T. Stagg, but there was nothing after the first sip. After letting it air out for a bit, this opened up to release more of the smoothness and caramel, but we would not suggest diving right in with this one. At the end of the day, this one left us wanting more, and just didn’t deliver. Zeke would be the first to tell you that he just didn’t want any more of it period. Bond & Lillard, on the other hand, definitely tasted like an aged bourbon. There was a complexity and fullness that wasn’t present with the Old Ripy. This was quite interesting, considering the fact that the Bond & Lillard has a lower age statement and lower proof. The burn on this one was mid-mouth, typical of most bourbons, and was quite enjoyable. There was spice, vanilla, caramel, and hints of fruit like apples. Bond & Lillard delivers where Old Ripy should have in the age, maturity, and expectations of such a release. Overall Verdict: We can both agree that you should pass on the Old Ripy. We both can agree that $50 for a 375ml is just too much for this juice and just happens to be a lot of marketing with not a lot of payoff. The bourbon tasted thin and was unfulfilling. For Bond and Lillard, we’re a little bit torn. John would tell you to sip it at a bar, where Zeke would tell you to wait for John to order it and then convince him to give you a taste. Either way, we are a little discouraged at this new move to 375ml bottles for $50. This is a trend that finds itself to even places like George Dickel, and Diageo, with their release of Dickel 17 at 375ml bottles for $80. Honestly, we wish they would have charged a reasonable price and put them out at full 750ml bottles. It’s one thing for a craft distillery to charge a little more considering what it takes for them to get started, however, when it’s some of the biggest players in the game putting out half bottles for the same price, that almost equates to slap in the face to the consumer.